In late 2013, Dipika started to feel sick but doctors couldn’t figure out what was wrong. After months of CT scans, MRI scans and bone marrow tests, the doctors told her it was secondary breast cancer. “I was the first in my family to be diagnosed with breast cancer. I didn’t know anything about it,” says Dipika. So Dipika decided to fight. On her 45th birthday she started her first round of chemotherapy. Not long after her diagnosis, she joined Sweet Louise. 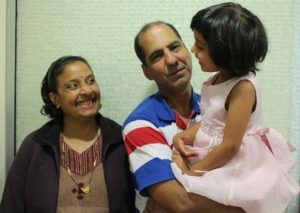 Dipika was so sick after treatment, she couldn’t attend Sweet Louise meetings for months. But ever since she’s been able to attend, she makes the most of her time with people facing the same journey. For many Sweet Louise Members, spending time with others dealing with the same diagnosis is a source of strength and support. The meetings range from discussions on cancer treatments, planning for the future and nutritional tips to scrapbooking and complementary therapies. Having a support group when going through treatments, receiving bad news or having a bad day is essential for Sweet Louise Members. Thanks to supporters like you, Members have a group of people to get them through the toughest time of their lives. “Sweet Louise helps me cope on the days when it gets too hard. The other Members are so generous in sharing their stories and strength and they help me to be brave,” says Dipika. Because Dipika doesn’t drive, one of our amazing volunteers brings her along to every meeting. “Thanks to Sweet Louise, I have nurses and Members supporting me, encouraging me, and above all, caring for me and my family,” says Dipika. For many Sweet Louise Members, having that extra support is an essential part of coping with cancer. Without you, Members like Dipika wouldn’t receive the support they need during the toughest time of their lives. Our heartfelt thanks to you.